These two runners could stake a very good claim on being the greatest British distance runners of all time. Not only did they achieve such great things but they did so at a time when running for sport was relatively unheard of. There were no books to read on how to optimally run long distance, they had to find out via experiementation and much of what they learned and did became the standard practice. The two runners are Arthur Newton and Peter Gavuzzi. Newton took up running to protest against his treatment in South Africa and used it first as a means of gaining publicity for his cause. He managed to gain some by winning the first four Comrades races. Peter worked in the docks in Southampton and first met Newton in 1928 in Los Angeles. The book charts their close relationship over the years from their first meeting in 1928 at the start of the first ever Trans America Footrace. Arthur Newton was invited by the race director CC Pyle to give some credibility to the event as he was perhaps the only known world class runner there. Newton dropped out in the first two weeks with injury but carried on in the race as medical/morale support. While doing so he became close friends with Gavuzzi who was winning the race all the way up until 400 miles to go when he had to drop out with infected gums. He had nothing to eat for days and was wasting away. He was pulled out of the race by the medical team. Newton and Gavuzzi both vowed to go back the next year, when the race was being run from New York to LA. Newton didn't finish for similar reasons to the previous year. I won't spoil the incredible ending to this race other that to say that Gavuzzi proved himself to be absolutely world class. After the events of the second trans USA race Newton and Gavuzzi remained close training partners and were a class above everyone else. Newton held the records for everything from 30-100 miles and he and Gavuzzi were a formidable team. They agonised over the choice to become professional runners and try to make a living with thier amazing gift, having plenty of rifts with the UK Amateur Athletics Association as they did. The book is a great account of many of their adventures, snow shoe races in Canada, record breaking in the UK and France, what they got up to when they were held in France during the war. It is a fascinating insight into how elite runners at the time lived and also contains a huge amount of Newtons own advice and principles on running long distance. 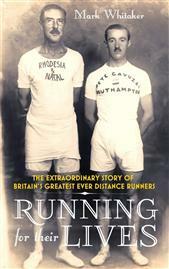 A brilliant account of two runners who the UK should be immensely proud of. And has inspired me to ahem "organise" a run from Bath to London later in the year to follow the footsteps of Arthur Newton when he broke the world record in 1929 for 100 miles (14.22) then broke it again when he was 51 by running 14.06. Amazing runners and amazing story.